The second Make Cycle for CLMOOC kicked off yesterday and we are now plunging out way into the concept of remediation — of considering the ways in which technology and composition strategies change/alter the message of the original media/composition. Check out the CLMOOC newsletter, done as collective voice in an art museum, as video. The script is the same as the text (see it here) but the brings the ideas alive, particularly when the group finds the right art for the right moment. That’s part of the remediation of words, when image and sound inform/change the writing. I am always intrigued by remediation ideas, particularly in this age of digital media, and so I have decided to take a poem I wrote the other day and bring it through some various remediation this week. The origin is a tweet by Jeffrey Keefer, who wrote about a term I had never come across before: liminality. The more he tweeted out about it, the more I found this poem forming. It may be that I am not as deeply informed about liminality as Jeffrey is (in fact, I know that to be true), and I found myself shifting more towards Vygotsky’s Zones of Promixal Development. with only a few more questions as bumps in the road …. Well, this is not completely true, either. I had a little sticky note that I write the first draft of the poem on. It was a mess. I accidentally tossed it away. You won’t see the true origin of the poem, unfortunately — only the first remediation of it as I typed it out. Then I decided to share the poem out via Twitter, so I turned to one of my favorite writing/style sites called Notegraphy. The site gives your presentation frames for text, and this began my first element of remediation and a question: How would I present my poem so that the style would complement the message of the writing? It’s more difficult than it seems, given a vast amount of choice, and I ended up with this very simple design, tilted a bit on its axis. 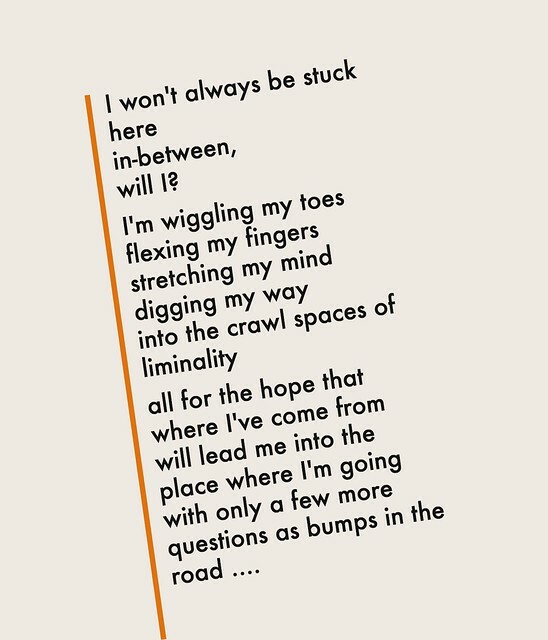 For me, this tilt seemed to metaphorically represent the heart of the poem — of questioning what it means to be in the middle of learning something — not quite a novice and not quite an expert. The poem came to look like this, which I mostly liked, except that the design screwed with my line breaks .. which brings to the surface the concept of “agency” of the writer, and how far do we go to force our own vision on what technology does to our vision. Here, I accepted the change, reluctantly. I compromised with technology. It didn’t even know or care, of course. But I do. I still do. 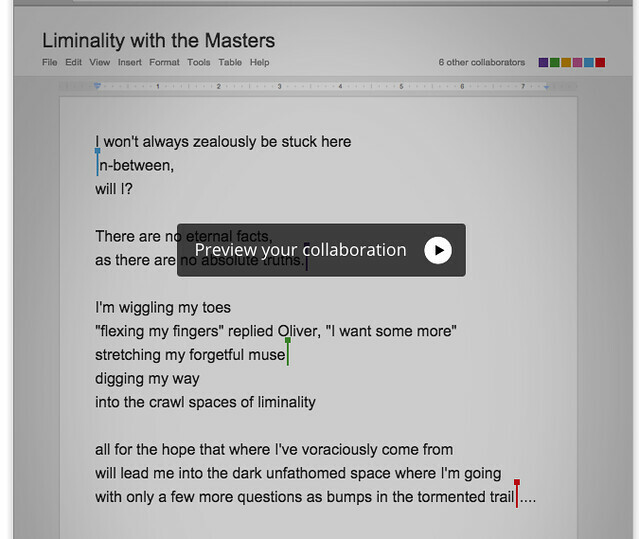 Then I decided to go another step .. of using the Docs Demo: Master’s Edition by Google that allows you to write in an experimental Google Doc with some “masters” of writing. What would they do to my poem? And more importantly, how much of my poem was I willing to give up to the unknown media changers? For this, I held on to little, allowing Google’s site to do what it would with my words, in the name of the experiment. I have more ideas brewing for the next few days … will remediate. This entry was posted in CLMOOC, Poetry. Bookmark the permalink. I am feeling stuck in this week’s make: everything I do is remediation. Everything. Think I will focus on the revival of Zeega for good or ill.
God’s Speed … (what does that even mean?) … and let me know how I can maybe help …. On it’s own, I enjoy this poem. I am a practicing meditator and enjoy the feeling of letting go to accept what will come. The notion of liminality is cool on many levels for us as people, educators, and learners. I enjoy the re(media)tes and look forward to what comes next. I enjoy your ongoing theme of dealing with agency and control between versions. I look forward to your next iterations. Thanks .. it feels like a tree, with branches going out in different directions .. the question is: what does all that do to the roots of the poem? And, how do we bring this work to the classroom? What does that look like? I think that the beauty of what you did, and the lesson to the classroom, is to experience agency in the process rather than the initial work product. The collection of your ongoing iterations and your reflections on these iterations is the adult process of creating within the context of a “growth mindset.” Your project is the design process, the problem-solving process; that is the lesson. antispam: ok egrets, fly away, mediate the sky.